The Dean of Medicine College Dr. Abdul-Salam bin Nour Wali and the College Vice Dean for Academic Affairs Dr. Ghassan bin Salem Nouman visited the Deanship of Admission and Registration. They were received by the Vice Dean of Admission and Registration Dr. Khalid bin Thamir Al-Thaqafi and the Vice Dean of Admission and Registration for Academic Affairs Dr. Hossam bin Hassan Hakami on Wednesday Sha'ban 30, 1439 H at the university campus in Abdyia. 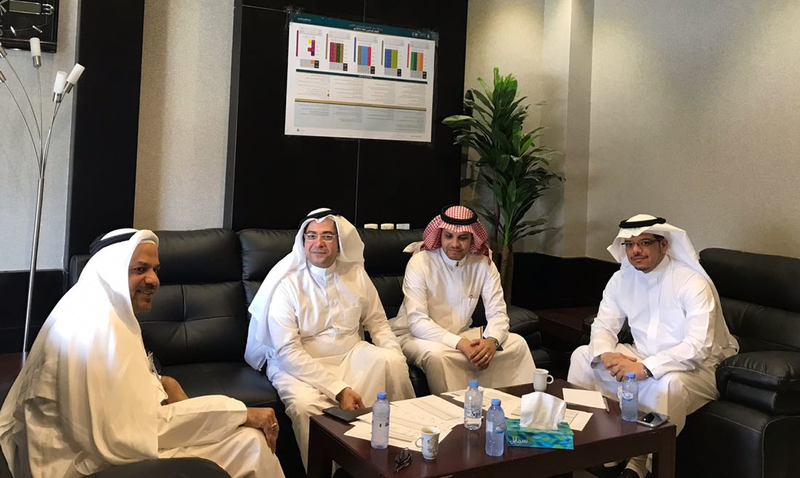 During the visit, the Vice Dean of Admission and Registration welcomed the Dean of College of Medicine and the Vice Dean for Academic Affairs and they discussed aspects of joint cooperation between the Deanship and the College besides discussing admission matters in the programs provided by the college and anything related to the academic affairs. It should be noted that the deanship endeavors to provide all its services electronically under the support if the UQU President Prof. Abdullah Bafail. Such development in the e-services is set to keep pace with the Kingdom Vision 2030.